Our representative will welcome you at the Delhi airport or Delhi railway station, depending on how you reach the capital. Then, you will be transferred to Rishikesh, where on arrival, our representative will assist you to check into your camp. The rest of the day you are free to participate in the in-house activities, such as cards, volleyball, badminton, and carom, or just spend your time resting and relaxing. You will be staying overnight in the camp in Rishikesh. After a hearty breakfast in the Rishikesh camp, you will begin your white water rafting adventure. The route is 16km long, stretching from Shivpuri to NIM Beach. 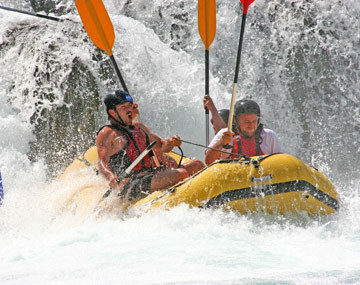 After being taught the safety rules, you will embark on your white river rafting trip. You will return to your Rishikesh camp for lunch and then you are free to enjoy rest of the day at leisure. You can participate in the in-house activities or just laze around. You will be staying overnight in the camp. After breakfast, you will checkout from the camp in Rishikesh and proceed to the panoramic Patna Waterfall. After spending some amazing moments at this cascade, you will begin your drive back to Delhi airport or the railway station for your onward journey. Most Rishikesh tour packages offer you an opportunity to visit ashrams, temples and to learn and practice yoga and meditation. While Rishikesh is home to the sacred Triveni Ghat, which is renowned for its Ganga aarti in the night, this city lying at the foothills of the Himalaya also offers adrenaline-pumping white river rafting opportunities. So, after visiting Lakshman Jhula and the majestic Trayambakeshwar Temple, you can enjoy the adrenaline rush as you try to master the rapids and test your strength and stamina against nature. Rishikesh is merely 225km from Delhi, the drive takes about five to six hours, depending on the traffic. However, arranging every aspect of your Rishikesh tour can be tedious, time-consuming and cumbersome. That is why you should check out our Rishikesh holiday packages that offer you a bigger bang for your money. When you book Rishikesh rafting packages from Delhi, we organise everything - transportation from Delhi to Rishikesh and back, hotel accommodation, local sightseeing and of course, your white water rafting trip. And, our Rishikesh holiday packages are affordably priced, making them one of the most sought-after packages. I am an adventure lover so the best thing for me in the Rishikesh was River Rafting. Oh My God the water splash on you when you move against the flow of river is amazing.